The classic of classics Champagne drink. Depending on the occasion, event or party, the ratios of freshly squeezed orange juice to sparkling wine can be altered not only for the taste, but also the strength. Traditionally it is given as a 'Welcome drink' at weddings and formal events as it is so easy to create and so versatile. Christmas day is the most traditional day of the year to drink a Bucks fizz - breakfast time with smoked salmon and oysters. The ratio of a Bucks Fizz is generally 3:1 or 3:2 depending on the strength one wishes to have. 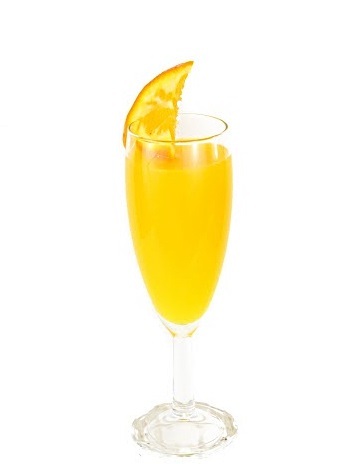 Combine the Sparkling wine (Prosecco, Champagne or any sparkling wine) with fresh orange juice to the ratio you wish. Serve in a Champagne flute. Garnish with a quartered orange. In 1919 The Bucks Club was founded - a Gentleman's Club located at 18, Clifford Street in London SW1 (and still there today). The first bartender to serve in the Club (1919 to 1941) was Malachy (also known as Pat) McGarry. He is credited as the creator of the Bucks Fizz Cocktail in 1921. Supposedly invented in order for Gentlemen to begin imbibing in the morning. McGarry (whom also appears in three of P.G. Woodhouse books as the Bartender at the fictional Drones Club - a thinly disguised name for Bucks Club) is also credited with creating the Sidecar Cocktail in 1922. Champagne being an aristocratic libation, was the natural (and ingenious) choice of McGarry to blend with freshly squeezed orange juice. Traditionally it has been a melange of 3 parts Champagne and 2 parts Orange Juice. Champagne is not the only sparkling drink that can be used to make a Bucks Fizz. Literally any good sparkling wine, including Italian Prosecco can be used. The fresher the squeezed orange juice, the better the final result will be. The choice to include orange juice 'bits' is entirely up to you. In 1924, the Mimosa Cocktail was created in Paris. The combination of sparkling wine and orange juice is the same, however the proportions should be exactly equal - 50:50.